previous pic of bronze statute: Roy Disney with Minni Mouse at Disneyworld. ROY DISNEY (son of Walt's brother Roy O. Disney), passed away this week. 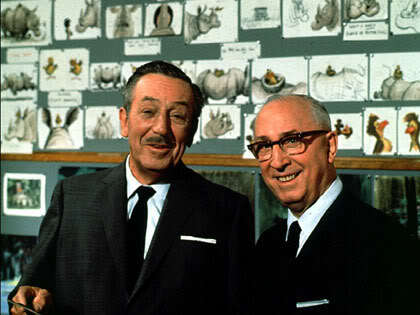 The head of Disney took over after his famous uncle died as the last heir of the Disney family corporate lineage. Roy went on to continue his uncle's dreams, steering the company through many ups and down during his leadership, including bringing Disney Hall into fruition (with Frank Ghery as architect despite difficulty raising the money), and after launching Disneyworld at great expense many shareholders disagreed with. Yet, he completed Walt's vision as his uncle had hoped, while expanding it greatly to incorporate PIXAR into Disney's world and animation library. We all grew up with enchantment of Walt Disney's vivid imagination, and fondly love the remarkable contribution the Disney family brought to entertaining generations of kids and adults worldwide.